So I was tooling around this morning to find some challenges to play with and found this EXCELLENT CASE Study inspiration! And then the Free For All challenge on SCS was ‘show me your spots’ (or any shape). Well…simple enough…you put the two together and this is what you get! How fun is this? And why HOORAY for today? Well TWO of the Create with Connie and Mary Design Team Members are offering BLOG CANDY TODAY!!! 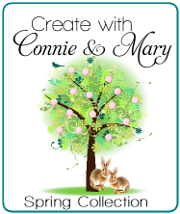 Head over to Create with Connie and Mary to find out who and visit their blogs! Whisper White – 3 1/2 x 4 3/4. Stamp greeting using Versamark and white emboss. Rub Smoky Slate ink over. Layer on Basic Grey 3 5/8 x 4 7/8. Add to card front using dimensionals. 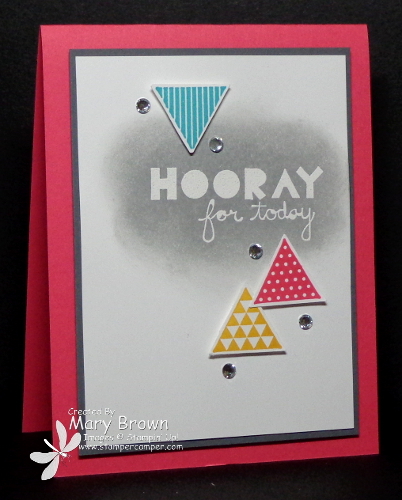 Stamp triangles using Crushed Curry, Strawberry Slush and Bermuda Bay, punch with Triangle punch add to card front using dimensionals. And just a quick reminder this is Preview Week for Create with Connie and Mary Spring Collection 2014! If you missed it…I shared my FUN preview project Monday…CHECK IT OUT! Early bird special – $24.95 for 4 weeks of EXCLUSIVE project ($5 savings) goes through Saturday! Don’t wait! You don’t want to miss out!